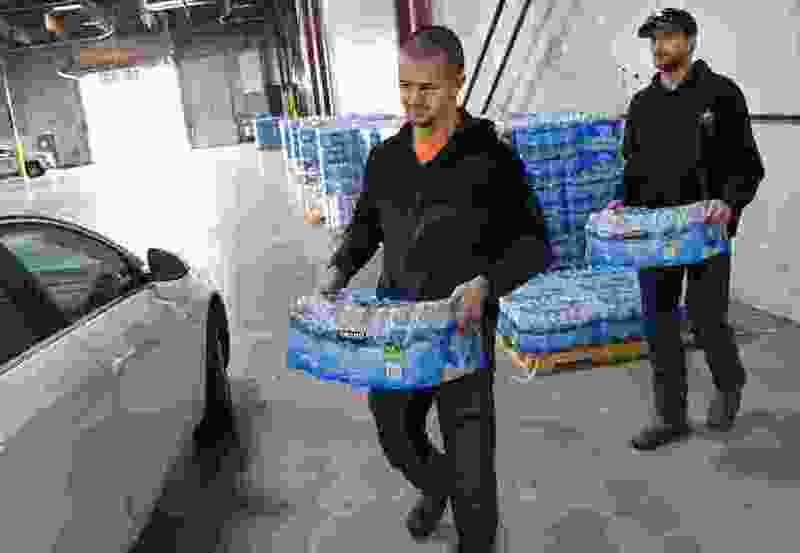 (Francisco Kjolseth | The Salt Lake Tribune) Elliott Purser, center, and Cody Hook with Sandy City load up cases of water into the trunk of a resident at the Sandy Operations Center at 9150 South, 150 East on Sunday, Feb. 17, 2019. The city says the problem with its water supply started about Feb. 6, when a fluoride pump malfunctioned because of a power outage. It flooded the water system with fluoride and that also led to high levels of lead and copper, enough that it made some people sick. The Sandy City Council took its first steps Tuesday toward conducting an independent investigation into the city administration’s response to a fluoride pump that malfunctioned and flooded parts of the local water system with unsafe amounts of the mineral last week. After a sometimes emotional, nearly 45-minute public hearing on the issue Tuesday, the council unanimously approved creation of a technical committee that will not include city personnel or elected officials and will be made up of no fewer than three experts. It will audit the city’s emergency management practices, look into the city’s communication efforts in light of the emergency and provide recommendations for how to deal with future issues. “I believe the City Council has a duty to get to the bottom of this situation,” Council Chairwoman Kris Nicholl said before the vote. Sandy Mayor Kurt Bradburn, who told residents at a rare Presidents Day government town hall on the drinking water issues on Monday that he had “failed” the city as an elected leader in several aspects of the emergency, also expressed support for an independent investigation. Many Sandy residents have expressed frustration that they were allowed to drink possibly tainted water for a week before they heard about the problems, which began because of a power outage at one of the city’s wells on Feb. 6. The city deemed the water safe to drink on Sunday. About 150 people were in the audience Monday night; more than a dozen spoke at the formal council meeting Tuesday, and almost all of them expressed support for an investigation. “An independent investigation is really important to figure out what happened, what we can do better and what needs to happen at the city level or the state level to make sure the health and safety of the public is always the priority,” said Rep. Suzanne Harrison, D-Draper, whose district includes parts of Sandy. While experts say fluoride is beneficial in small doses, unsafe levels can cause health issues. Residents in the affected Sandy area reported gastrointestinal problems and stomach cramping and pains after drinking the water, and they expressed concerns in their comments about the short- and long-term effects of that exposure for themselves, family members and pets. They also worried about the impacts the incident could have on their homes, where acid from the fluoride corroded some pipes. The Utah Department of Environmental Quality has cited the city for the high fluoride levels and is determining if Sandy appropriately reported elevated levels of lead and copper. The City Council will formalize the technical committee’s members at a future meeting and will also consider whether to create a citizen advisory committee.